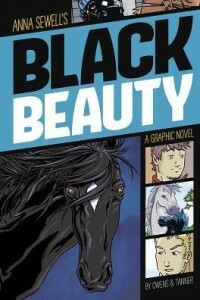 In this graphic novel adaptation of Anna Sewell’s Black Beauty readers will be able to learn the story of one of the most famous horses in all of literature. The book begins with a short introduction as to who Anna Sewell is and where her beloved novel came from. Then there is an introduction to many of the various characters (most of them horses) who play important roles in the story—from Black Beauty’s birth to the last place Beauty lives. The illustrations are good, although at times some of the other horses or characters don’t look quite as thoughtfully drawn and colored as Black Beauty. And even though the cover looks like Black Beauty is on it, that illustration doesn’t look like the rest of the pictures of Black Beauty where there is a blue-black spiky mane (even when he isn’t properly taken care of). The people in this story seem to come and go (as is part of the story) but that only strengthens the fact that this is Beauty’s story. This is a solid introduction to a classic tale, told in such a way that young readers will be able to understand what is happening. The book also includes common core reading and writing questions.